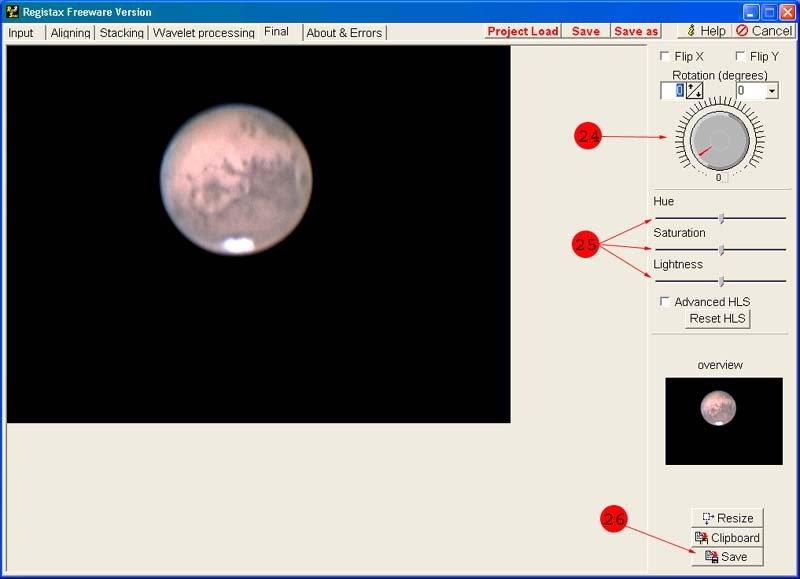 Here's my attempt to document the steps I normally use to process planetary images in Registax. 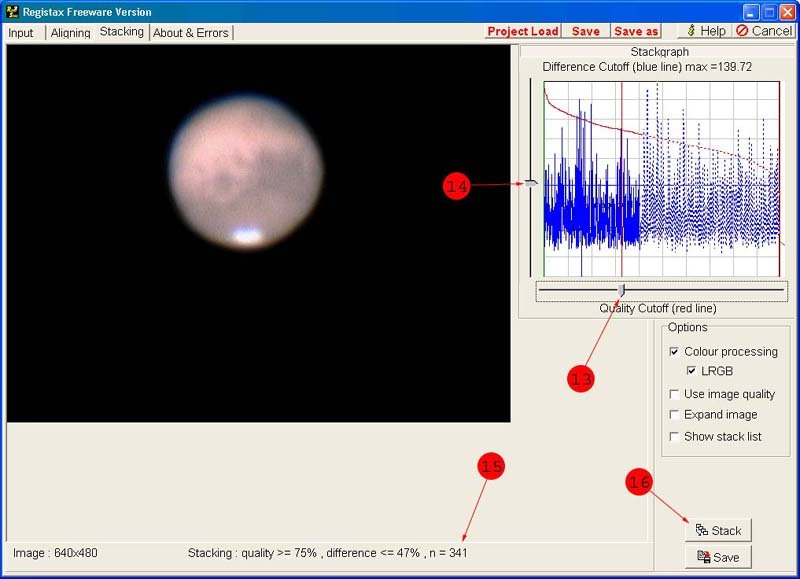 This is not intended to cover all the features of Registax, but it should be a good starting point to help get you underway with processing your .avi files in Registax. The numbered steps are intended to match up with the numbered red circles in each screenshot. 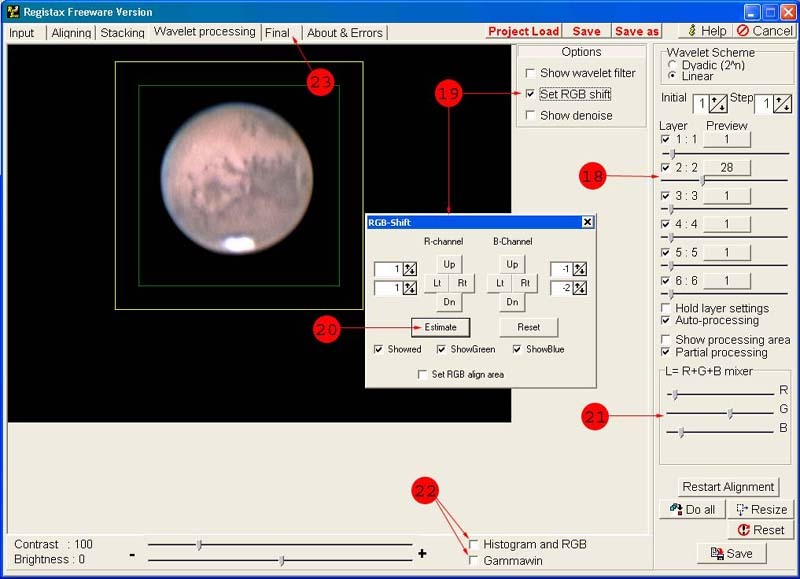 1) Hit the Select Input button and open the .avi video or set of FITs files you wish to process. 2) Make sure the Colour processing box is checked and I like to also check the LRGB option but it's not required. 3) Select an alignment box that will fit around the planet, center the box over the planet and then click the mouse. The program will automatically switch over to the Aligning tab. Alternatively, some imagers like to use a smaller box and center it around a feature like the southern polar cap. When processing images of the moon I usually use a small alignment box and a feature like a crater to perform the alignment. 4) I like to uncheck the Auto-Optimisation box so that I can manually tweak the settings before optimizing the alignment. 5) Hit the Align button and the initial alignment will be performed. 6) Now I like to tweak the settings for optimization. The Lower quality setting determines the cutoff for where Registax will stop optimizing frames. This feature is mainly to save time since you don't want to optimize frames you plan to throw out anyway. 7) For this image I'm going to initially decide to eliminate the lower 60% of the images so I look at the value of the red quality curve for the point where 40% of the images fall under the curve. This looks like about 73% so that's what I will set the Lower Quality setting to. 8) Hit the Optimize button and the alignment will be refined for all images up to the point where you see the blue line become dashed. 9) Here you can see how the blue line becomes dashed right near the 4th line marking 40% of the images since the Lower quality setting was changed to 73%. 10) The progress dialog for optimization is a little misleading since optimization will be complete at the point where the dashed blue line starts which will be 40% for this image. 11) Remember you can always hit the Cancel button if you want to make an adjustment to the Lower quality setting. Just hit the Optimize button again to restart the processing. 12) After Optimization completes, click on the Stacking tab to move on to the next step. 13) Now you can refine which frames are stacked into the final image. Move the slider for the vertical red line and it will set a cutoff on the red quality curve. All frames that fall to the right of this red line, which corresponds to all images with a quality rating lower than 75% (see bottom of window), will not be used. 14) Next you can move the slider for the horizontal blue line and it will set a cutoff for the blue difference curve. All frames that fall above this blue line, which corresponds to all images with a difference rating greater than 47% (see bottom of window), will not be used. 15) You can look at the bottom to see how many frames are going to be included when stacked. There will be 341 frames stacked for this image based on the settings I've chosen. This indicates that 341 frames fall below the blue line and to the left of the red line. 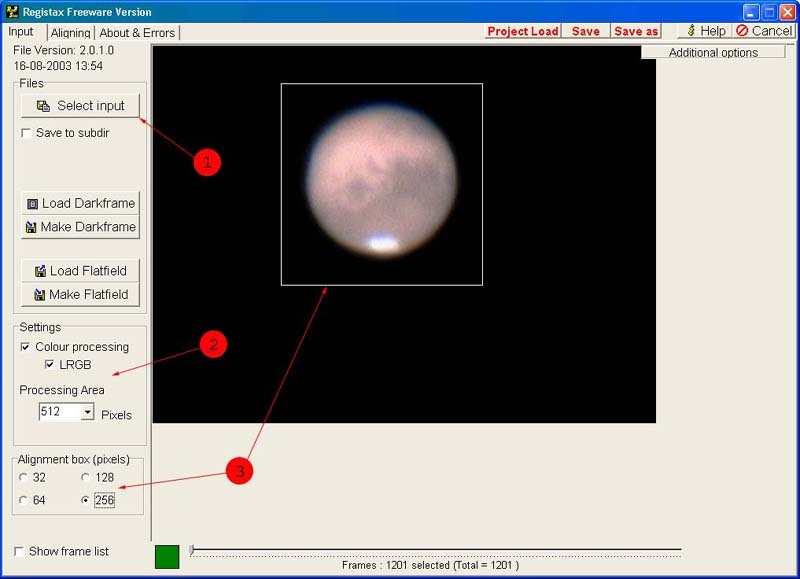 16) Hit the Stack button and the selected frames will be stacked. 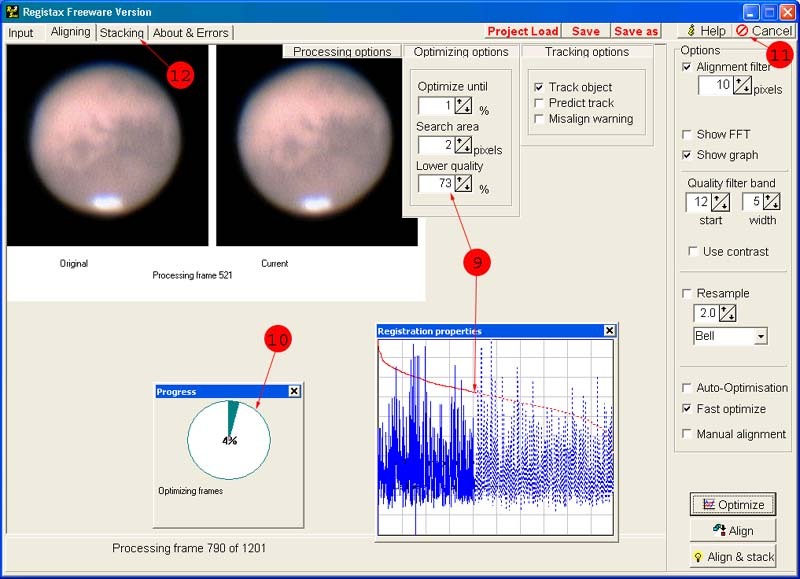 17) After the stacking process completes the Wavelet processing tab will appear. Select this tab to move on to the next step. Below you can see the result of the stacked frames before any additional processing has been done. 18) Now I tweak the wavelet settings to sharpen the image. I like to use the Linear mode with a step size of 1. For most of my images I normally only make adjustments to layer 2 and 3. For this image I only tweaked layer 2. The wavelet adjustments just take a lot of experimenting. The tweaks will vary based on your image scale and the quality of the image. Plus everyone has a different taste when it comes to sharpening. I try not to over sharpen my images since I prefer a more natural smooth look. 19) This is a nice feature that became available in version 2.0. Select the Set RGB shift checkbox to make adjustments to the color planes. 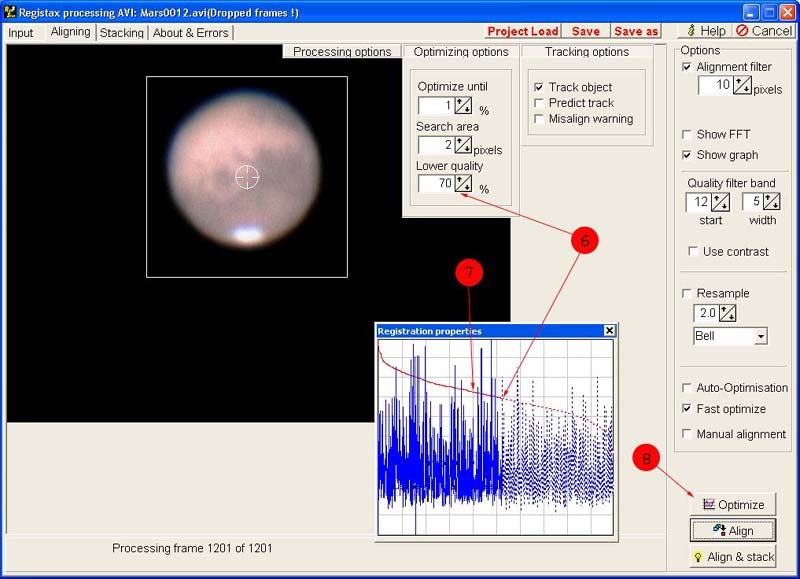 20) I've had good results just using the Estimate button and letting Registax calculate the offsets. 21) The R+G+B mixer section is shown if you selected the LRGB checkbox earlier. 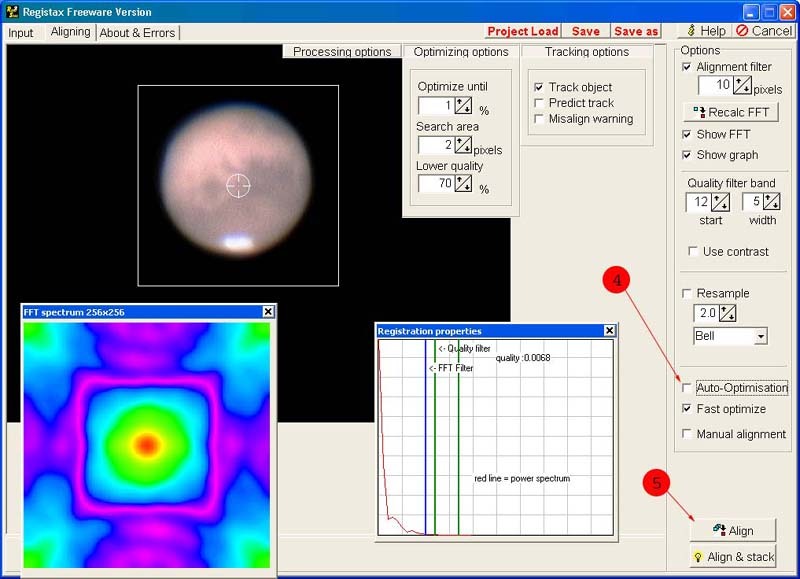 This determines the weighting for creating a Luminance channel from your color data. I recommend you experiment with these sliders to see what type of effects it can produce. 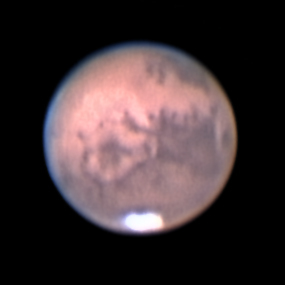 For Mars I find that the red areas are too bright if you have the R slider far to the right. You can lower that intensity by pulling the R slider to left as you can see I did for this image. 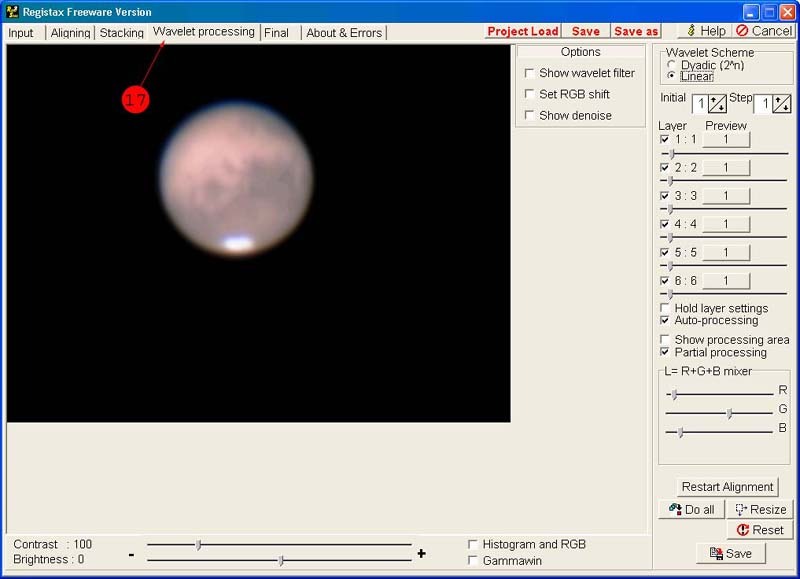 22) Some other nice new features in Registax 2.0 are the ability to tweak the histogram and gamma settings if desired. The brightness and contrast can also be adjusted with the sliders at the bottom. 23) Select the Final tab to finish up. 24) Here you can rotate the image if needed to achieve the desired angle. There are also boxes for flipping the image horizonatally or vertically. 25) Adjust the Hue, Saturation, and Lightness to your taste. Using the advanced HLS feature you can really tune these settings to target different wavelengths in the color spectrum. Personally I haven't used these features much. 26) Finally remember to save your work! Good luck with your webcam images!